As negotiations towards finding a solution to the political crisis in Guinea-Bissau continue, the Security Council today reiterated its readiness to consider targeted sanctions against those involved in last month’s military coup if the situation is not resolved. 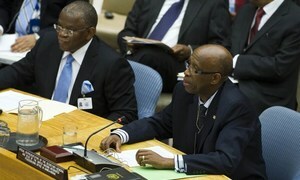 “The members of the Security Council expressed their commitment to continue to follow closely the situation in Guinea-Bissau and reiterated their readiness to consider targeted sanctions against the perpetrators and supporters of the military coup, should this situation remain unresolved,” the 15-member body said in a statement issued to the press. Soldiers in Guinea-Bissau – a country with a history of coups, misrule and political instability since it gained independence from Portugal in 1974 – seized power on 12 April. Calls by the international community for the return to civilian rule and the restoration of constitutional order have so far gone unheeded. The Council’s statement followed a briefing to the Council yesterday by the Secretary-General’s Special Representative to Guinea-Bissau, Joseph Mutaboba, who underscored that the continued delay in the return to normalcy is negatively impacting innocent citizens who want to see a speedy resolution to the crisis. He also noted that the Council should consider acting to stop those who hinder the dialogue process. “The Council may wish to consider the imposition of targeted measures against those continuing to impede the return to constitutional order in the country,” said Mr. Mutaboba, who heads the UN Integrated Peacebuilding Office in Guinea-Bissau (UNIOGBIS). Council members welcomed the release of Interim President Raimundo Pereira and Prime Minister Carlos Gomes Júnior – both men had been detained since mid-April – and demanded the immediate and unconditional release of all other detained officials. In addition, they expressed their deep concern at reports of looting; human rights violations and abuses, including arbitrary detentions, ill-treatment during detention and violent repression of peaceful demonstrations; and recalled that those responsible for such violations must be held accountable. The Council welcomed the initiatives of international partners to address the current crisis, especially the mediation efforts led by the Economic Community of West African States (ECOWAS). It also called on the regional body, in coordination with the UN, the African Union and the Community of Portuguese Speaking Countries (known by the Portuguese acronym CPLP), to pursue its efforts to implement its ‘zero tolerance’ policy against the unconstitutional take-over of power in Guinea-Bissau, and enable the restoration of the constitutional order. The current political crisis in Guinea-Bissau is worsening the living conditions of its citizens, a United Nations envoy said today, stressing that an inclusive sustainable solution among all national stakeholders is needed to put an end to the turmoil.